Butterfly gardening is a great way to bring another facet of gardening into your back yard. Live butterflies are creatures that really bring the web of life to the forefront in your garden. The butterfly in its various stages of life depends on different plants for different things. From egg to larva to pupa to adult butterfly, the life cycle of the butterfly takes place in various areas of your garden. They are important pollinators, so it is to our advantage to encourage their visits. Eggs are laid on plants. The various species of butterflies have specific plants that they use as hosts. Some use plants of the same family while some, like the Monarch utilize only one plant. In the larval or caterpillar stage, they are basically eating machines spending all of their time eating or searching for food. When the caterpillar is fully grown, it looks for a place to anchor itself to a plant and it transforms into a pupa or chrysalis. It is inside the chrysalis that the caterpillar undergoes the amazing metamorphosis into an adult. When a live butterfly emerges from its chrysalis, it must spend time unfolding its wings by forcing blood into them and letting them dry and harden. A good place to have your butterfly garden is on the south to east side of your home or other sheltering such as a hedge or fence. Butterflies will often spend the early hours of each day warming themselves before taking flight. A water source can be a shallow dish filled with sand or a small puddle-like depression that can hold a small amount of water. 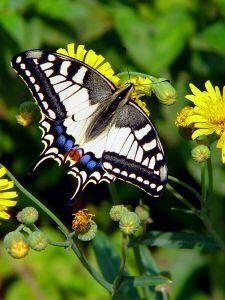 For the best opportunity to create a garden that is hospitable to butterflies, your butterfly garden plans should include plants that are good butterfly nectar plants as well as suitable host plants for the caterpillars. Planting flowers in masses will help attract butterflies. Carrots, dill and fennel are host plants that will feed swallowtails. Asters and sunflowers provide both food and nectar. Planting native wildflowers is also a good way to attract butterflies, but many of the wildflowers that are attractive to butterflies such as milkweed, clover and Joe Pye weed are also considered weeds by many. The one thing that you should NEVER do is use any kind of pesticide in your butterfly habitat. All pesticides are lethal to both larval and adult butterflies, even so-called organic pesticides. Observing butterflies up close is a fairly simple task if you are careful. Moving slowly, keeping behind the butterfly and not letting your shadow cross over the butterfly are the basic rules. Follow them and the hours spent cultivating your butterflies garden will pay off with hours of enjoyment watching them enjoy the habitat that you created for them.